Purpose-built for the MSP to deliver always connected Internet, firewall, edge router and other security features for the small- to medium-sized business. Datto partners drive our roadmap. That’s why we continue to expand and add new features and capabilities directly influenced by MSP feedback. Businesses stay connected with Internet that is always up and running with fully integrated 4G LTE failover. No contracts. No tracking data usage. No charges for overages. An additional service option available for the D200, LTE Management utilizes LTE to give you access to manage and configure the D200 even when the Internet is down at the client site. But that’s not all. With LTE Management, you can manage and configure any Datto device on the network, including other Datto Networking devices, Datto BCDR devices and even devices you are managing through Datto RMM. This is MSP-Centric networking at its best, full management access even when the primary Internet connection goes down. With throughput speeds of up to 1.7 Gbps, you get high performance, advanced routing capabilities such as layer 7 deep packet inspection (DPI), NATing rules and client/site-to-site VPN functionality. Whether it’s Client VPN (IPSec, IKEv2 and OpenVPN) or Site-to-Site VPN (DNA to DNA, DNA to non-DNA, Hub & Spoke), Datto Networking is committed to delivering robust VPN support to you and your clients. This deep level of analysis enables the appliance to categorize traffic by application, and lays the groundwork for enhanced layer 7 features and capabilities. Configuration settings and ongoing management of the Datto Networking Appliance begins in the cloud. The Datto Partner Portal is where you can go to configure and manage the Datto Networking Appliance. Networking Status enables at-a-glance views of all Datto Networking deployments with simple visual cues of a device's connection status, including if the device is in failover mode. Setting up network configurations takes a matter of minutes, not hours or days. All that’s left is to plug in the networking devices. Simple, rapid deployment born in the cloud. 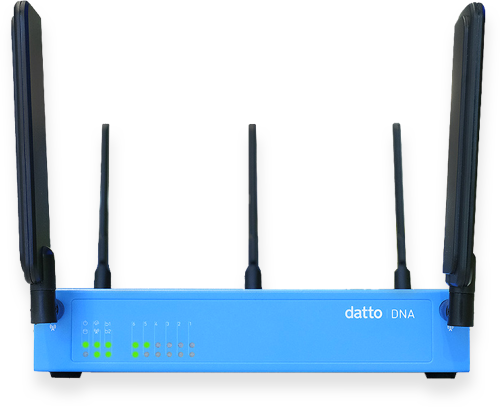 With an edge router, integrated WiFi, firewall, intrusion detection and prevention combined with the fully integrated 4G LTE Internet failover, the Datto Networking Appliance delivers everything you need to deploy a network for your small- to medium-sized clients. Built for performance and with room to grow, the appliance continues to provide more advanced routing features in an ever-growing platform that delivers what you need. The DNA actively identifies any packets that shouldn’t be there and proactively prevents them from affecting the network. The end result is secure connectivity that you can count on. Incorporating advanced security features such as stateful packet inspection, layer 7 DPI, port forwarding, DMZ host, and VLAN segregation, the appliance delivers peace of mind for you while protecting your clients’ networks. As many networking appliances are physically located in a back room, in a closet or simply “out of the way,” there are scenarios where the location of the appliance can cause interference and negatively affect the appliance’s ability to connect to the LTE network. To remedy this situation, Datto provides an optional, external antenna. This additional antenna support creates more flexibility and options for you to deploy the Datto Networking Appliance, and improves connectivity, even in low signal environments. The D200 is ideal for a client who needs a high performing edge router at an affordable price. The router’s quad-core processor includes an integrated hardware offload engine that enables it to run Deep Packet Inspection (DPI) and Quality of Service (QoS) at line rate gigabit speed. It’s rated at 2+ million packets per second throughput while running DPI. With two passive PoE ports, the D200 is a perfect fit for bundling with Datto Networking Access Points. Simply plug the APs in, mount them anywhere, including in locations that do not have power nearby, and you’re good to go. The D200 offers two LTE subscription options. First is the fully integrated 4G LTE failover for always connected Internet. The second option, new and available only with the D200, is an LTE Management option, a service that utilizes LTE to give the MSP access to manage and configure the D200 even when the Internet is down at the client site. This new LTE option enables the MSP to manage and configure any Datto device on the network, including other Datto Networking devices, Datto BCDR devices and even devices being managed via Datto RMM. The D200 was born in the cloud, and is access through the same portal as Datto Networking APs, Switches and Managed Power devices. Or, if you are on the go, just use the Datto Networking Mobile app. It’s simple cloud management, purpose built for the MSP. Incorporating advanced security features such as stateful packet inspection, layer 7 DPI, port forwarding, enhanced web content filtering and VLAN segregation, the D200 delivers peace of mind to MSPs looking to protect their client’s networks. At Datto, we believe in the value of great products and an unwavering commitment to 24x7x365 customer service and support. Every Datto Networking product ships with our advanced replacement warranty, meaning that if you have an issue with your device, we ship you a new one before you send your damaged device back. That way users are always connected. MSP-Centric Networking, the Datto Way.